When Dartmouth College graduate student Simone Whitecloud landed in Greenland this July, 70-degree temperatures and mosquito-free skies greeted her. It was an auspicious start for the Ph.D. candidate in Ecology and Evolutionary Biology who joined four Dartmouth professors and one other graduate student in Greenland for two weeks in a reconnaissance mission. Their task? Plan out the 2010 and beyond curriculum for the Integrative Graduate Education and Research Training (IGERT) award from the National Science Foundation: the Dartmouth IGERT in Polar Environmental Change. "Greenland is incredibly beautiful," said Whitecloud. "And it was surprisingly hospitable while we were there." Simone Whitecloud, a Ph.D. candidate in Ecology at Dartmouth College traveled to Greenland this summer to help plan the upcoming Dartmouth IGERT summer curriculum. During their field stay, the six-person team explored Greenland, seeking potential locations for short field studies for next summer's group of graduate students. "We were all giving feedback and brainstorming in the field," said Whitecloud. "It was a combination of all of us looking at the landscape and thinking up potential study questions and projects that students could do in a few days as a group." 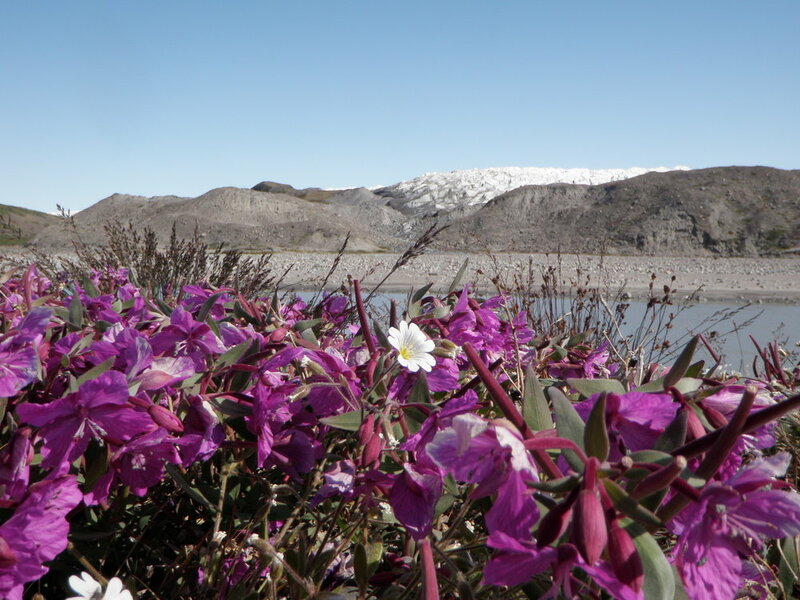 The IGERT team discovered there's more to Greenland than ice--like flowers blooming near Kangerluusuaq, for instance. Photo by Simone Whitecloud. Interdisciplinary in the most holistic sense: the cycle of life and death. The crew came upon a musk ox carcass near Kangerluussuaq. Photo Simone Whitecloud. Beginning next summer, students in the Dartmouth IGERT in Polar Environmental Change will enhance their core curriculum for graduate programs in Earth Sciences, Engineering Sciences, or Biological Sciences with summer fieldwork in Greenland, where they will work at the University of Greenlandand with the Inuit Circumpolar Council. The program will strike a balance between rigorous scientific field work and cultural immersion, encouraging students to explore the human aspects of the study subjects, said Whitecloud. "The human side of the IGERT program interested me because I want to work with indigenous Greenlanders who have important knowledge of their country and of the changing climate," she said. "This program facilitates more of an open dialogue between the researchers and the native people." Whitecloud is a Native American of Anishinaabeg (Chippewa) descent from New Orleans. Despite her pursuit of "hard" science, she said the interdisciplinary approach of the IGERT program is a crucial component of her education. "One of the struggles for me as an academic is to balance my heartfelt connection with nature with the objective view science requires," she said. The Greenland ice sheet begins. Photo Simone Whitecloud. Dartmouth IGERT fellows will also interact with mentors who have expertise in the atmosphere, ice, snow, sea ice, soil, surface and ground water, vegetation and animal populations, and human dimensions of environmental change. Fellows apply separately to specific graduate programs and indicate their interest in the IGERT component. During the summers of 2010-2012, fellows will spend approximately four weeks in Greenland, including a two-week field-study and a two-week exploration of policy issues—specifically the human dimensions of climate change—based in Nuuk, Greenland’s capitol. During the field work, students will be grouped into two disciplines: terrestrial studies based in Kangerlussuaq, and firn/ice studies based from Summit Station. artmouth professors Ross Virginia, environmental science, and Xiahong Feng, earth sciences, collect soil samples. Virginia directs the IGERT Ph.D. program in Polar Environmental Change. Photo Simone Whitecloud.